"I doubt that this country has had a more honest leader than I,” said former president Lula on the eve of his appeal hearing. SÃO PAULO, BRAZIL – Amidst heavy security, the appeal hearing of former President Luiz Inacio Lula da Silva started on Wednesday morning in Porto Alegre, with prosecutors and defense lawyers trying to sway the decision of the three judges. Outside the courthouse and in major Brazilian cities, thousands of both supporters and opposition gather to wait for the decision. 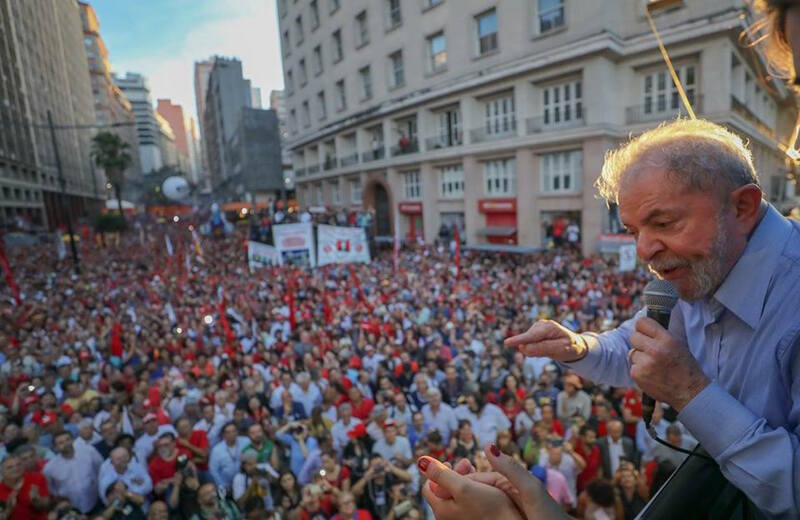 Former President Lula addresses thousands of supporters in Porto Alegre, photo internet reproduction. On Tuesday demonstrations against and in favor of the former leader were held in several cities of the country. From Avenida Paulista, in São Paulo to Copacabana Beach in Rio de Janeiro, hundreds rallied for and against the former president. “The average citizen who goes out every day to work, he wants justice, he wants justice to be done. We are here to say that we believe the law is for everyone, whether powerful, wealthy or famous, the law is for everyone,” Vem pra Rua spokeswoman, Adelaide Oliveira told journalists in São Paulo. The group is against Lula. A few blocks away supporters from the Frente Brasil Popular (Popular Brazil Front) held signs such as ‘Brazil already knows, election without Lula is Fraud’ and ‘Lula president’. Ex-president Lula was sentenced in July of 2017 to 9 years and 6 months in prison for passive corruption and money laundering in the case involving the ownership of a triplex in the coastal city of Guarujá, in São Paulo. Lula’s lawyer claims that the former president never owned an apartment in the coastal city and that the judge, Sergio Moro’s analysis and consequent sentence was ‘biased and factitious’ void of any viable and substantial proof and relying on the testimony of a single person, who signed a plea-bargaining agreement with the Prosecutor’s Office for a more lenient sentence. Although in many cities, those in favor and against the former president were separated only by a police line during the demonstrations on Tuesday, no major incidents were reported. 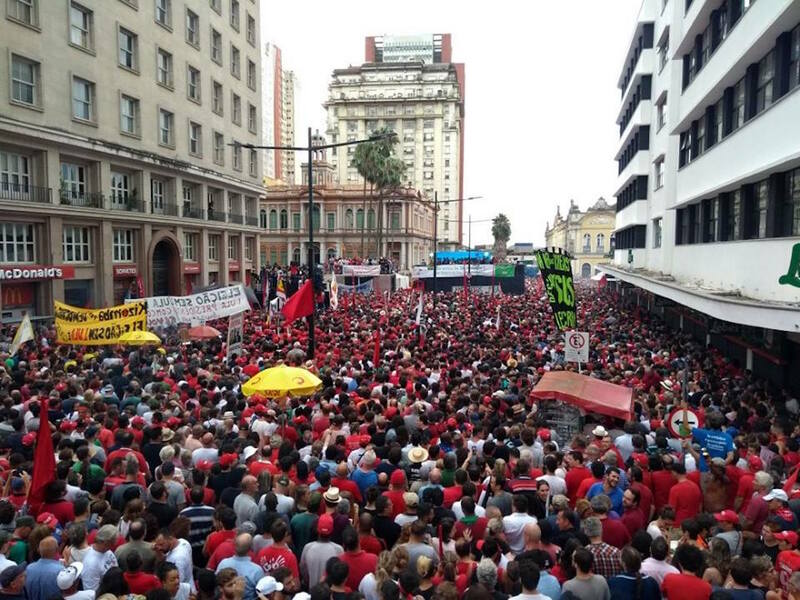 Supporters in Porto Alegre, many of whom faced several days of bus travel to be present in the Southern city during the hearing, were addressed by Lula himself on Tuesday night. Thousands gather in Porto Alegre to show their support for former President Luis Inacio Lula da Silva, photo by Guilherme Daldin/MST. During the half-hour speech, Lula, who was accompanied by also former president Dilma Rousseff and other PT (Workers Party) leaders, denied any wrongdoing. “I know I did not commit a crime. I doubt that this country has had a more honest leader than I,” he said to a cheering crowd. Lula flew back to São Paulo after the rally to wait for the judges’ decision in his apartment. Analysts say that even in the case of a 3-0 vote to maintain the conviction, the defense may still appeal to the Supreme Court and that there is no possibility that the former leader could be arrested after this hearing, since he still has the right of appeal. The fear among Lula supporters is that if the decision is upheld it could hinder the former president’s plans to be a candidate for this year’s 2018 presidential elections. Recent polls have Lula in first place in the race with a wide margin between he and a second-placed candidate. If the conviction is upheld, Lula could be included in the Ficha Limpa (Clean Bill), which makes those with convictions ineligible to run for public office. However, say some lawyers, there is a breach in the law that would guarantee the registration of his candidacy. “If convicted, he could still appeal and as long as there is room for the conviction to be reversed, he could try to suspend the ineligibility,” attorney Carolina Cleve told news agency, Agencia Brasil. I just hope that political positions of the court would not affect the Justice, that should be above political parties questions. I am trying to do this kind of analysis in my website about how Lava Jato affects Rio. in any form, even as the cleaner of public latrines. He is a disgrace to the country and the people. without worrying that their leaders are robbing them blind.